Home Depot Pro Savings Valid Tue January 16 – Mon January 29, 2018 The Renovation event ~ Buy more, save more bulk price Available on select in-stock insulation, drywall, concrete, shingles, tile set materials and moulding. 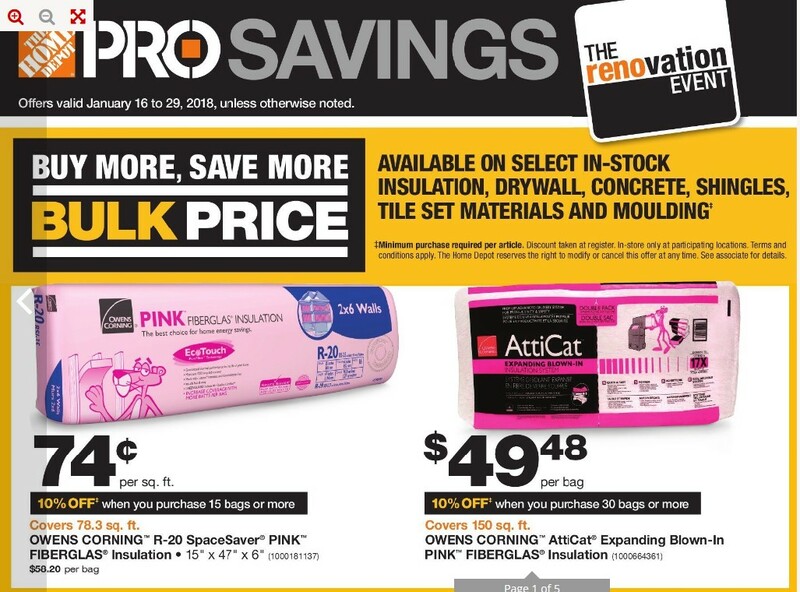 Visit Home Depot Flyer and find Ownes Corning R-20 SpaceSaver Pink Fibreglas Insulation #1000181137 $58.20/bag Regular Price $0.74/sq. ft. Sale Price 15" x 47" x 6". 10% off when you purchase 15 bags or more. Ownes Corning AttiCat Expanding Blown-In Pink Fibreglas Insulation #1000664361 $49.48/bag Sale Price Covers 150 sq. ft. 10% off when you purchase 30 bags or more. 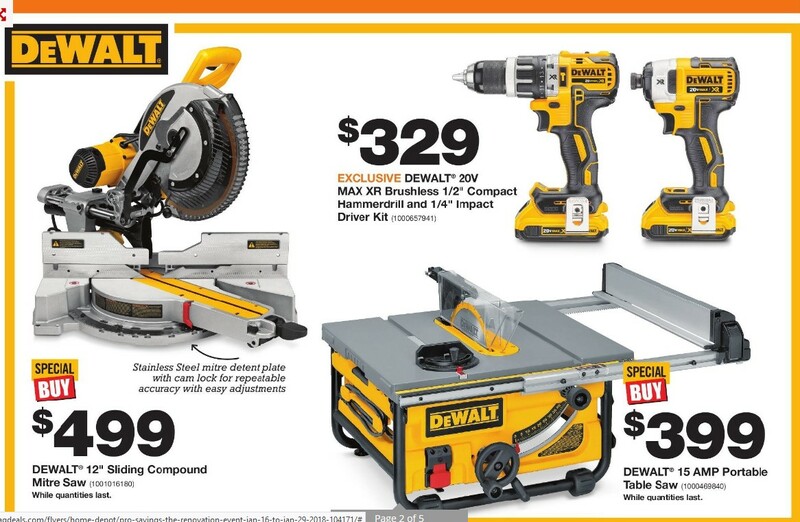 DeWalt 12" Sliding Compound Mitre Saw #1001016180 $499.00 Sale Price While quantities last. Stainless steel mitre detent plate with cam lock for repeatable accuracy with easy adjustments. 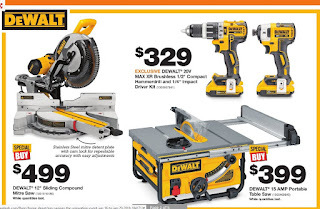 DeWalt 20V Max XR Brushless 1/2" Compact Hammerdrill And 1/4" Impact Driver Kit #1000657941 $329.00 Sale Price 3-mode LED provides lighting in dark or confined spaces - up to 20X brighter than previous model. DeWalt 15 AMP Portable Table saw #1000469840 $399.00 Sale Price While quantities last. 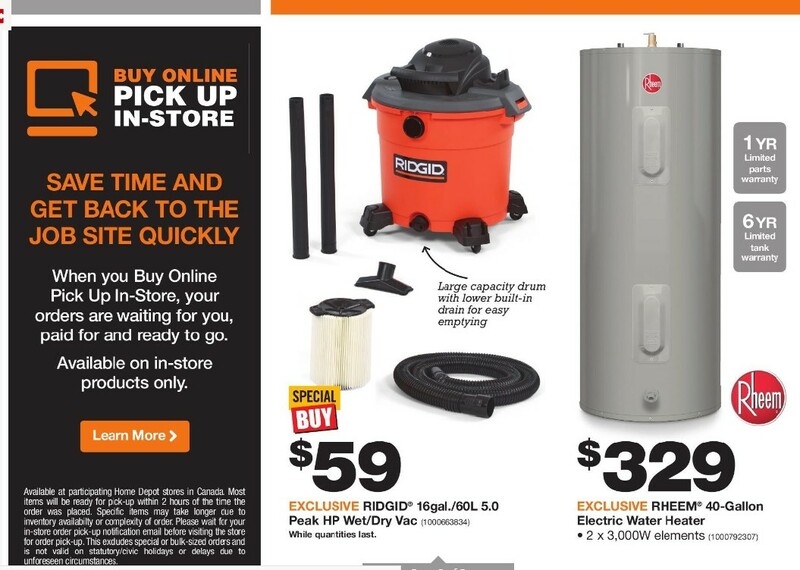 Also find special buy for Ridgid 16gal./60L 5.0 Peak HP Wet / Dry Vac #1000663834 $59.00 Sale Price While quantities last. Large capacity drum with lower built-in drain for easy emptying. 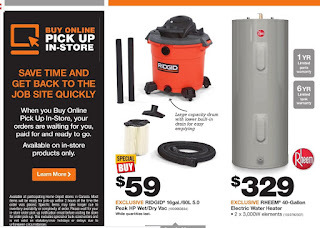 Rheem 40-Gallon Electric Water Heater #1000792307 $329.00 Sale Price 2 x 3,000W elements. 1 yr limited parts warranty. 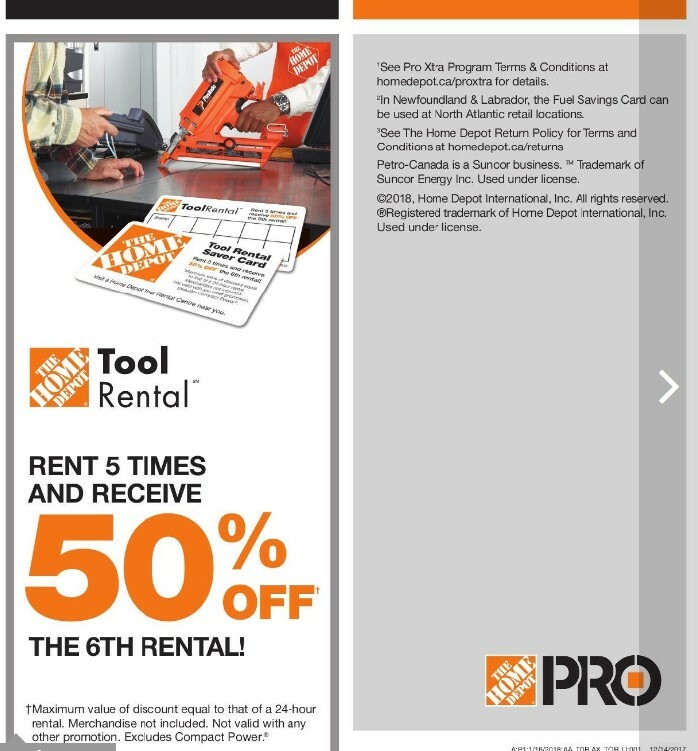 6 yr limited tank warranty. 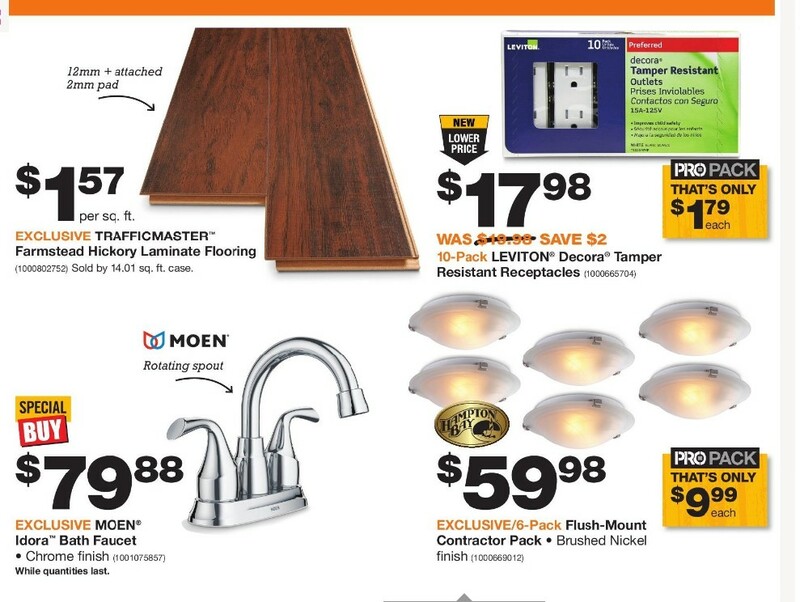 Trafficmaster Farmested Hickory Laminate Flooring #1000802752 $1.57/sq. ft. Sale Price Sold by 14.01 sq. ft. case. 12mm + attached 2mm pad. Moen Idora Bath Faucet #1001075857 $79.88 Sale Price Chrome finish. Rotating spout. While quantities last. Leviton Decora Tamper Resistant Receptacles #1000665704 $19.98 Regular Price $17.98 Sale Price $2.00 Savings 10-pack. That's only $1.79. How to get Hampton Bay Flush-Mount Contractor Pack #1000669012 $59.98 Sale Price Brushed nickel finish. That's only $9.99.